Ahmed III (Ottoman Turkish: احمد ثالث, Aḥmed-i sālis) (30/31 December 1673 – 1 July 1736) was Sultan of the Ottoman Empire and a son of Sultan Mehmed IV (r. 1648–87). His mother was Gülnuş Sultan, originally named Evmania Voria, who was an ethnic Greek. [excessive citations] He was born at Hacıoğlu Pazarcık, in Dobruja. He succeeded to the throne in 1703 on the abdication of his brother Mustafa II (1695–1703). Nevşehirli Damat İbrahim Pasha and the Sultan's daughter, Fatma Sultan (wife of the former) directed the government from 1718 to 1730, a period referred to as the Tulip Era. Ahmed III cultivated good relations with France, doubtless in view of Russia's menacing attitude. He afforded refuge in Ottoman territory to Charles XII of Sweden (1682–1718) after the Swedish defeat at the hands of Peter I of Russia (1672–1725) in the Battle of Poltava of 1709. In 1710 Charles XII convinced Sultan Ahmed III to declare war against Russia, and the Ottoman forces under Baltacı Mehmet Pasha won a major victory at the Battle of Prut. In the aftermath, Russia returned Azov back to the Ottomans, agreed to demolish the fortress of Taganrog and others in the area, and to stop interfering in the affairs of the Polish–Lithuanian Commonwealth. 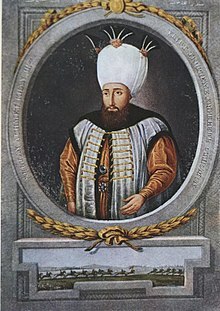 Forced against his will into war with Russia, Ahmed III came nearer than any Ottoman sovereign before or since to breaking the power of his northern rival, whose armies his grand vizier Nevşehirli Damat İbrahim Pasha succeeded in completely surrounding at the Pruth River Campaign in 1711. The subsequent Ottoman victories against Russia enabled the Ottoman Empire to advance to Moscow, had the Sultan wished. However, this was halted as a report reached Istanbul that the Safavids were invading the Ottoman Empire, causing a period of panic, turning the Sultan's attention away from Russia. Sultan Ahmed III had become unpopular by reason of the excessive pomp and costly luxury in which he and his principal officers indulged; on September 20, 1730, a mutinous riot of seventeen Janissaries, led by the Albanian Patrona Halil, was aided by the citizens as well as the military until it swelled into an insurrection in front of which the Sultan was forced to give up the throne. Ahmed voluntarily led his nephew Mahmud I (1730–54) to the seat of sovereignty and paid allegiance to him as Sultan of the Empire. He then retired to the Kafes previously occupied by Mahmud and died at Topkapı Palace after six years of confinement. Sultan Ahmed III receives French ambassador Vicomte d'Andrezel at Topkapı Palace. French ambassador Marquis de Bonnac being received by Sultan Ahmed III. Ahmed III left the finances of the Ottoman Empire in a flourishing condition, which had remarkably been obtained without excessive taxation or extortion procedures. He was a cultivated patron of literature and art, and it was in his time that the first printing press authorized to use the Arabic or Turkish languages was set up in Istanbul, operated by Ibrahim Muteferrika (while the printing press had been introduced to Constantinople in 1480, all works published before 1729 were in Greek, Armenian, or Hebrew). It was in this reign that an important change in the government of the Danubian Principalities was introduced: previously, the Porte had appointed Hospodars, usually native Moldavian and Wallachian boyars, to administer those provinces; after the Russian campaign of 1711, during which Peter the Great found an ally in Moldavia Prince Dimitrie Cantemir, the Porte began overtly deputizing Phanariote Greeks in that region, and extended the system to Wallachia after Prince Stefan Cantacuzino established links with Eugene of Savoy. The Phanariotes constituted a kind of Dhimmi nobility, which supplied the Porte with functionaries in many important departments of the state. In the year 1712, the Mughal Emperor Jahandar Shah, a grandson of Aurangzeb sent gifts to the Ottoman Sultan Ahmad III and referred to himself as the Ottoman Sultan's devoted admirer. The Mughal Emperor Farrukhsiyar a grandson of Aurangzeb, is also known to have sent a letter to the Ottomans but this time it was received by the Grand Vizier Nevşehirli Damad Ibrahim Pasha providing a graphic description of the efforts of the Mughal commander Syed Hassan Ali Khan Barha against the Rajput and Maratha rebellion. Fatma Sultan (22 October 1704 – 3 January 1733), daughter of Emetullah Kadın. Zübeyde Sultan (29 March 1728 - 4 June 1756), daughter of Musli Kadın. This episode was taken up by the modern Turkish writer Nedim Gürsel as the setting of his 2001 novel Le voyage de Candide à Istanbul. In fact, there is no evidence of the deposed Sultan being allowed to make such foreign travels, nor did Voltaire (or Gürsel) assert that it had any actual historical foundation. One or more of the preceding sentences incorporates text from a publication now in the public domain: Chisholm, Hugh, ed. (1911). "Ahmed III." . Encyclopædia Britannica. 1 (11th ed.). Cambridge University Press. p. 431. ^ Farooqi, N.R. (1989). Mughal-Ottoman relations: a study of political & diplomatic relations between Mughal India and the Ottoman Empire, 1556-1748. Idarah-i Adabiyat-i Delli. ^ Mughal-Ottoman relations: a study of political & diplomatic relations ... - Naimur Rahman Farooqi. Books.google.com. 1989. Retrieved 2012-04-29. ^ Aktaş 2008, p. 13-4. ^ Aktaş 2008, p. 112. ^ Aktaş 2008, p. 255-6. ^ Râşid 2013, p. 735. ^ Râşid 2013, p. 773. ^ Râşid 2013, p. 788. ^ Râşid 2013, p. 777. ^ Râşid 2013, p. 785. ^ Râşid 2013, p. 796. ^ a b c Efendi, Subhi Mehmed; Aydıner, Mesut; Şâkir, Hüseyin (2007). Subhî tarihi: Sâmî ve Şâkir tarihleri ile birlikte 1730-1744 (inceleme ve karşılaştırmalı metin). Kitabevi. p. 178. ^ Râşid 2013, p. 829. ^ Râşid 2013, p. 838. ^ Râşid 2013, p. 842. ^ Râşid 2013, p. 898. ^ Râşid 2013, p. 1170. ^ Râşid 2013, p. 1334. ^ Aktaş 2008, p. 32. ^ Râşid 2013, p. 1387. ^ Aktaş 2008, p. 80. ^ a b Râşid 2013, p. 1422. ^ Aktaş 2008, p. 111. ^ Râşid 2013, p. 1529. ^ Aktaş 2008, p. 205. ^ Râşid 2013, p. 1437. ^ Aktaş 2008, p. 125. ^ Râşid 2013, p. 1483. ^ Aktaş 2008, p. 164-5. ^ Aktaş 2008, p. 199. ^ Râşid 2013, p. 1564. ^ Aktaş 2008, p. 236. ^ Râşid 2013, p. 1589. ^ Aktaş 2008, p. 258. ^ Aktaş 2008, p. 257. Târîh-i Râşid ve Zeyli (Râşid Mehmed Efendi ve Çelebizâde İsmaîl Âsım Efendi) (1071-1141/1660-1729) Cilt I-III. 2013. ISBN 978-6-055-24512-2. Aktaş, Ali (2008). ÇELEBİZÂDE ÂSIM TARİHİ: Transkripsiyonlu metin. Silahdar Findiklili Mehmed Agha (2001). Nusretnâme: Tahlil ve Metin (1106-1133/1695-1721).